The University of Ibadan has been on strike for the past three weeks. And times like these are when you promise yourself that in your next life, if you mistakenly hear ‘NIGERIA’ while in your mother’s womb, you’ll choke yourself with umbilical cord…yes, someone actually tweeted that. Every morning, I pack my books and walk down to the library beside my hostel. I always take a novel with me to escape the pain that is Jurisprudence and Law of Business Association etc. I have finished two novels since the strike: MEASURING TIMES AND SECRET LIVES OF BABA SEGI’S WIVES. I had only started reading FISHERMAN BY CHIGOZIE OBIOMA when something happened. 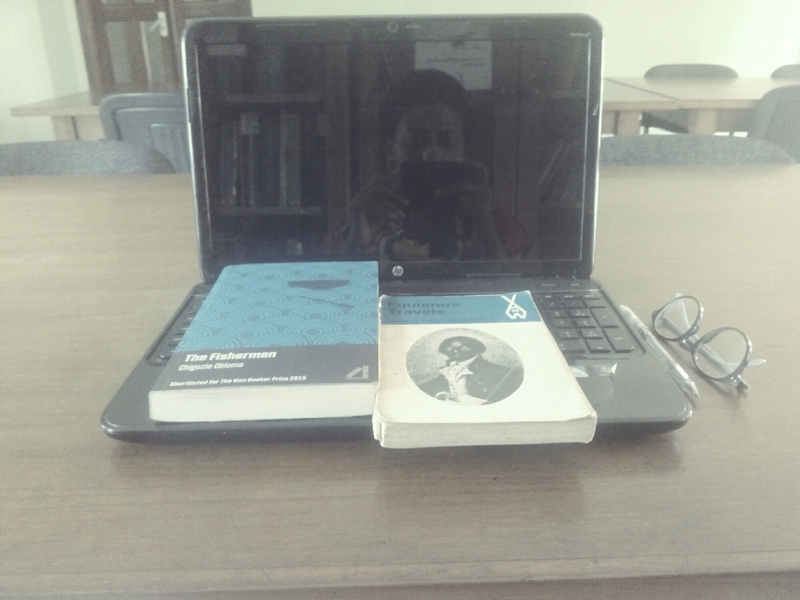 Last week while in the library, I came across a beautiful book; EQUIANO’S TRAVELS. The first time I heard about EQUIANO, I was in my second year and in the third month of an Academic Union Strike that lasted for Six months – Six Months of my precious life! I remember sitting on the bed at home and for want of something to do; I picked up my phone and went straight to Google where I typed: THE IGBO PEOPLE. That was the day I first heard about OLAUDAH EQUIANO. I forgot about FISHERMAN and quickly began EQUIANO’S TRAVEL. Sadly, I can’t take it out of the library and so I have devoted my time to reading two chapters each day and putting it up on my blog – for you all. Remember, no knowledge is a waste. I know most of you haven’t heard about OLAUDAH EQUIANO. 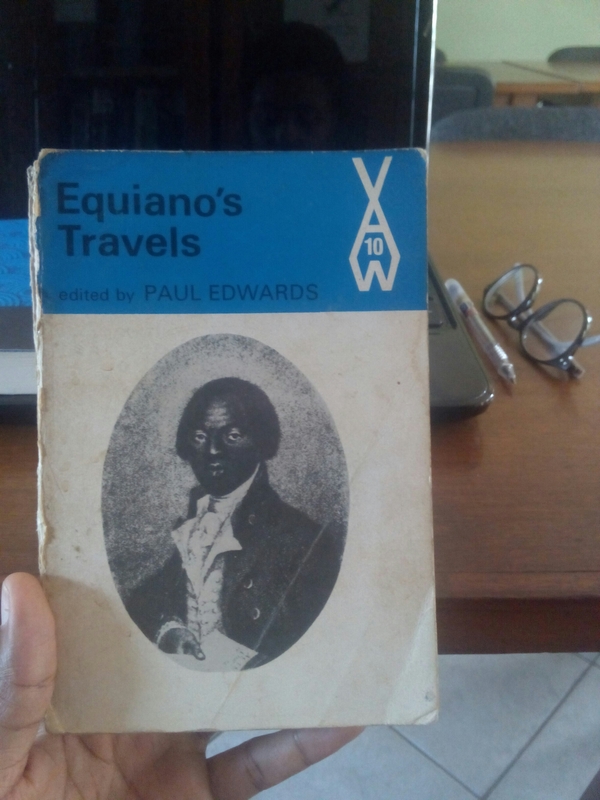 This book, EQUIANO’S TRAVELS is an autobiography written by Equiano himself – The interesting narrative of the Life of Olaudah Equiano or Gustavus Vassa the African. Paul Edwards, a Senior Lecturer, Department of English Literature, University of Edinburgh abridged and edited this version. 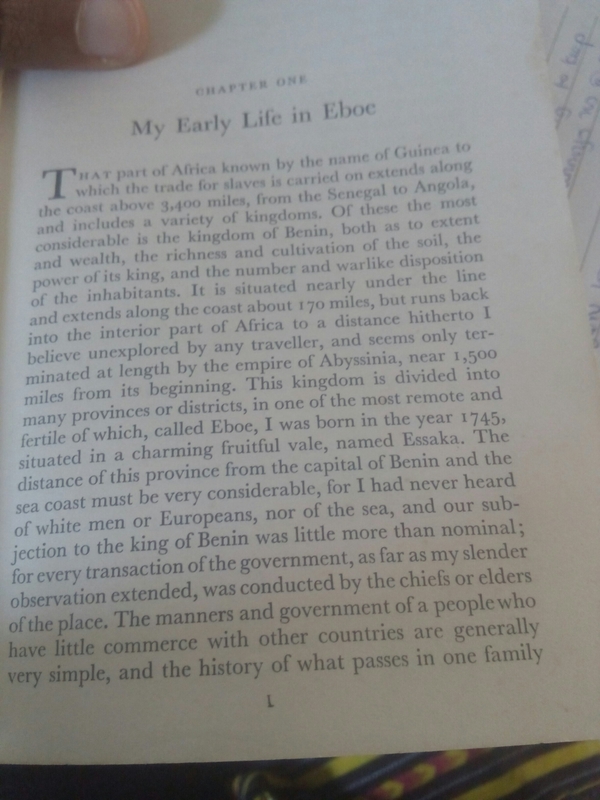 The book was first published in the year 1789; and according to the editor, the last edition to appear was an American one of 1837, and today, in Nigeria as elsewhere, Equiano’s book is not well known except to historians…AND ME! It has 14 Chapters in all and some miscellaneous verses. I’ll do my best to summarize each chapter. He begins by telling us of a part of Africa known by the name of Guinea which includes a variety of Kingdoms. One of the most considerable is the kingdom of Benin, both as to extent and wealth, the richness and cultivation of the soil, the power of its king, and the number and warlike disposition of the inhabitants. This kingdom is divided into many provinces or districts, in one of the most remote and fertile of which, called Eboe. He was born in the year 1745, situated in a charming fruitful vale, named Essaka. EBOE is actually IGBO and though the village of Essaka can’t be located with any certainty it seems to have been somewhere to the south-east of Onitsha and north of Owerri. In this chapter he talked about growing up in the village. My God! I felt like I was in one African Magic Igbo movie. Now, you should know that his account of his early life was vague seeing as he wrote this book 30years after his kidnap. He could only put down the little memories he had left of his people into this chapter. In those days, he said that adultery was sometimes punished with slavery or death. So sacred among them is the honour of the marriage bed and so jealous are they of the fidelity of their wives. The men however do not preserve the same constancy to their wives which they expect from them, for they indulge in a plurality, though seldom in more than two. He wrote about the mode of marriage and how married women wore cotton strings, the thickness of goose-quill around their waist. He said that his people were a nation of dancers, musicians, and poets. Thus, every great event such as a triumphant return from battle or other cause of public rejoicing was celebrated in public dances, which are accompanied with songs and music suited to the occasion. He said the dances had spirits and varieties which he had scarcely seen elsewhere. Dresses of both sexes are nearly the same. A long piece of calico or muslin, wrapped loosely round the body somewhat in the form of a highland plaid – usually dyed blue. Because of their simple manners, their luxuries were few. Their principle luxuries were in perfumes; one sort of these is an odoriferous wood of delicious fragment, the other a kind of earth, a small portion of which thrown into the fire diffuses a more powerful odour. The composition for the mud walls were mixed with cow dung to keep of the different insects which annoyed them at night. Usual seats were few logs of wood, but they had benches, which were generally perfumed to accommodate strangers: they composed the greater part of household furniture. In a state where nature was prodigal of her favours, wants were few and easily supplied…money was of little use. Everyone contributed to the common stock and as they were unacquainted with idleness they had no beggars. The benefits of such were obvious. The west India planters preferred the slaves of Benin or Eboe to those of any other part of Guinea for their hardiness, intelligence, integrity and zeal. During wars, even women marched boldly to fight along with the men because everyone was taught the use of these weapons – fire arms, bows and arrows, broad two-edged sword and javelins. Once during a war, a virgin of note among his enemies has been slain in the battle, and her arm was exposed in our market place where our trophies were always exhibited. There is an Igbo legend which tells that God decided not to allow their women fight the wars, since they were so fierce that they might have wiped out the world. Like the Jews, he said, they practiced circumcision and made offerings and feasts on that occasion in the same manner as they did. A virgin had been poisoned but it was not known by whom : the doctors ordered the corpse to be taken up by some persons, and carried to the grave. As soon as the bearers had raided it on their shoulders they seemed with some sudden impulse, and ran to and fro unable to stop themselves. At last, after having passed through a number of thorns and prickly bushes unhurt, the corpse fell from them close to a house and defaced it in the fall, and the owner being taken up, he immediately confessed the poisoning. Certain snakes, particularly the python EKE are reverenced amongst the Igbos and the harmless snake here was more likely to be a python than the ‘crowing snake’ – UBI, which is poisonous. (P/S : I’m done with FISHERMAN will give you all the review soon). Benin, Book Recommendations, books, Chinua Achebe, Culture, Equiano's Travels, History, Igbo, Igbo People, nigeria, Olaudah Equiano, Slavery, Tribe. Thank you. More Posts on it…. Stay tuned… Lol! Girl, you always nail it. Am so proud to be your class-mate. I think i have to go find my voice again in poetry. Keep it going. You will be a writer, probably i too, though my line of books are business or nutrition and spiritual growth. love u so much. I beg help me, i no dey read at home again ooo. where is d library? Seeuuuuunn… Awww, thank you my dearest! You have to find that voice. And it doesn’t matter the kind of books you read – we are all different readers. Just make sure you leave with something each time you turn a page. I’m so happy to have you as a classmate to – TAKE HOME TO MAMA! The library is at Imoran. Beside St. Annes. 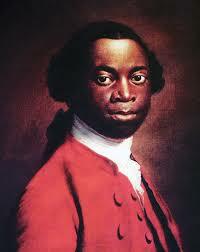 I first heard about Olaudah Equiano during the centenary celebration of Nigeria’s amalgamation. They made this promo video then and he was mentioned. I researched him and found he was a writer, but I never got to seeking out his book. Keep the reviews coming, we’ll be here reading. That’s wonderful! I’ll sure keep them coming.